Trading Your Car at a Dealer Could Cost You! If you’ve ever traded in your car at an auto dealership, chances are you’ve been a victim of price discrimination. 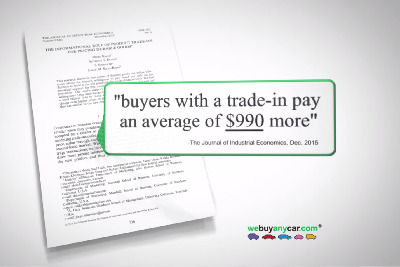 A new study published in The Journal of Industrial Economics shows, “buyers with a trade-in pay an average of $990 more than those who do not trade in1”. How can that be? The concept of trading in your car at a dealership is to lower the total amount paid for a new vehicle, so how do trade-in customers end up paying more than those negotiating with cash? “buyers with a trade-in pay an average of $990 more than those who do not trade in their used cars1"
The researchers were able to prove that auto dealers judge how much money a buyer is willing to pay for a new car, not only on his or her decision to trade in a car, but also its make, model and condition. Using this information they make assumptions about the customer and can discriminate against them by offering less of a discount on the new car, meaning customers who trade in pay an average of $990 more than customers buying the car outright. Do Dealers Reward Trade-In Customers for Brand Loyalty? "The findings from our empirical analysis support our theory of trade-in inferences. First, buyers with a trade-in pay an average of $990 more than those who do not trade in their used cars. Second, compared to a buyer who trades in a vehicle of a different make and model, a buyer pays $150 if the trade-in is the same make and $214 more if it is the same make and model as the newly purchased car.1"
It turns out that consumers who purchase the same make as the car they are trading in end up paying an additional $1,140 for the convenience of trading in. Trading in for the same make and model could cost you even more - potentially as much as $1,204. Why? Trading in your car for a similar model tells the dealership that you were happy with your previous purchase and aren't at risk of buying a competitor’s vehicle. Dealers assume you’re less likely to negotiate on price and more likely to accept their low offer. How Can I Avoid Dealer Trade-In Price Discrimination? The easiest way to avoid dealer trade-in price discrimination is not to trade in. Selling your car to webuyanycar.com is a great alternative to trading in. Buying cars is all we do. We’re not an auto dealership and won’t try to sell you a car. We put money in your pocket and the negotiating power back in your hands. By selling your car before stepping foot on the dealership lot, you simplify the deal and remove the dealership’s ability to discriminate against you. We make selling your car easy, and much easier than a private sale! In as little as thirty minutes, we’ll inspect your car and offer you a fair market value for your vehicle. We’ll complete all the paperwork for you and can even settle your loan or lease. You’ll walk out with a check in hand that you can deposit without delay and have the power to negotiate a better price for your new vehicle as a cash buyer. So what are you waiting for? Get your free 60 second online valuation now! To get a copy of the full study featured in The Journal of Industrial Economics please click here.